Gualala Robotics has done it again and this time they have created a beast in a very industrial light mover. 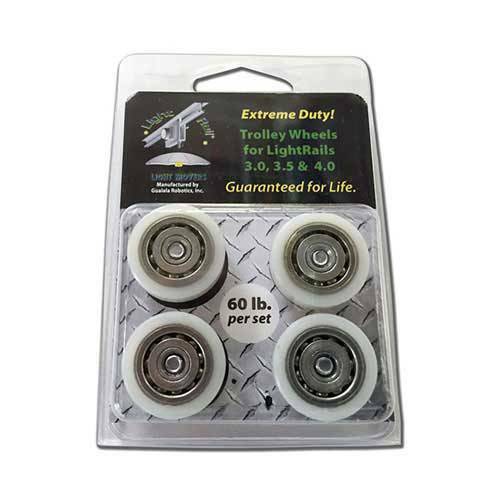 It is scalable, customizable and seriously commercial in that each trolley wheel set is rated to 60 lbs. 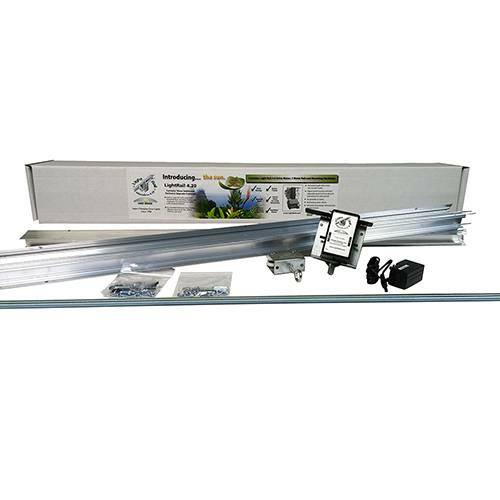 The LightRail 4.20 AdjustaDrive Kit grow light system comes complete. It’s ready to move two grow lamps along 13’ of Rail. 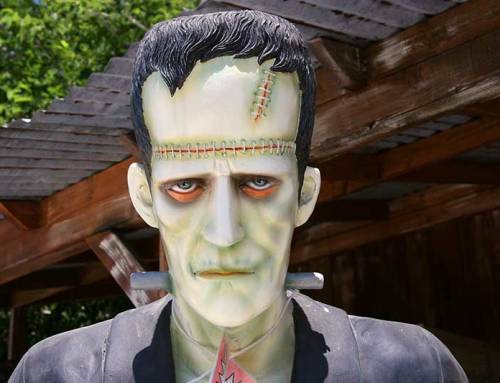 But, it can move up to three indoor grow lights in-line over 19’ of Rail. That’s with the grow equipment addition of one extra Add A Lamp Kit. To position indoor grow lights to be across from each other, simply repeat this double or triple grow light system the next row over. 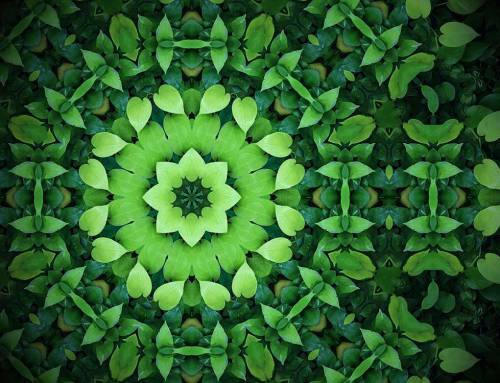 No longer does it matter the size of a commercial indoor growing system. That’s because with this industrial light mover indoor grow setup, we can easily plan out your grow equipment space. 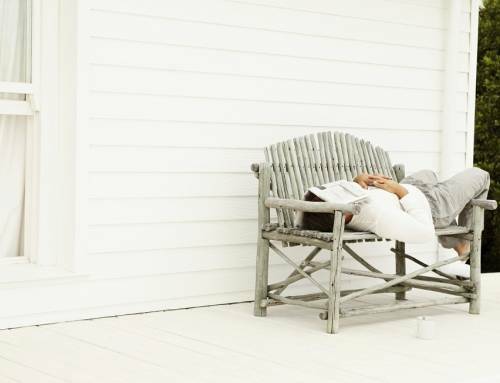 That space planning can be end to end and one row after another. LightRail 4.20 was created to brilliantly fill up any indoor grow setup. That’s for any size of garage grow room, basement grow room, indoor grow warehouse or indoor greenhouse – it’s just super scalable. LightRail 4.20, the industrial light mover, is made to get any job done. The special wheels are rated to 60 lbs so are ready to move the heaviest grow lamps and in any indoor grow light system. Aside from the instrument grade drive motor, the smart parts for these grow light systems are the pre-installed Extreme Duty Trolley Wheels. That is what makes this an industrial light mover grow equipment superstar. Plus, there is the included Add A Lamp Kit ready to move that second grow lamp. So, it’s not just smart but also convenient. And, we can purchase one more of each to move a third grow light. So, that’s one more Add A Lamp Kit and one more set of Extreme Duty Trolley Wheels. Note: The AdjustaDrive Motor and the Auxiliary Trolley come with Extreme Duty Trolley Wheels pre-installed. And, those are rated to 60 lbs and come with a lifetime warranty. 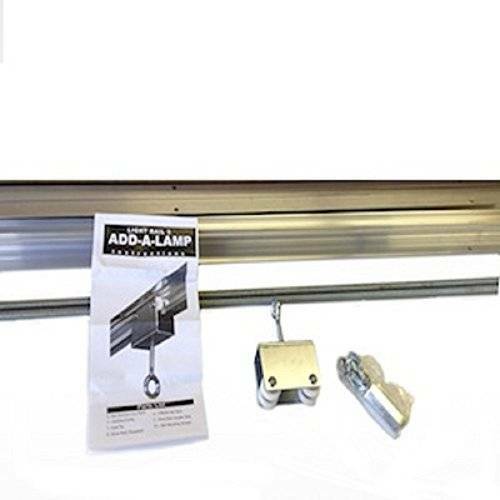 Also included in these grow light systems is the 2-4 feet per minute adjustable speed LightRail 4.0 Motor. And, with a 0-60 second adjustable time delay for the ends of the runs. Plus, there are two 6’6” Rails for 13’ of total Rail. And, there is a 6’ push/pull system with threaded rod for moving that second grow lamp. It also comes with hardware and instructions. So, it is a complete industrial light mover to move two indoor grow lights, each on its own 6’6” Rail. LightRail 4.20 AdjustaDrive is super simple, super smart. For planning our indoor grow setup, we can think of this in one of two ways: We can think two indoor grow lights along 13’ of Rail, repeated as much inline as we need for our length until we move one row over and do that again, then the next row and so on to fill up our indoor grow setup. For each 13‘of length, that will need one LightRail 4.20 AdjustaDrive Kit. 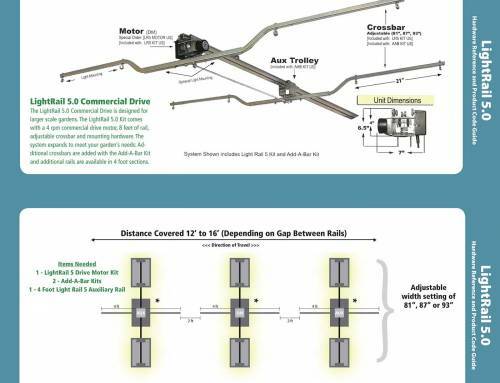 A shopping list for a 30’ long by 8’ wide space, as one example, could be two LightRail 4.20 AdjustaDrive Kits, end to end for 26’ of length and then another row of two LightRail 4.20 AdjustaDrive Kits running parallel, so a total of four LightRail 4.20 AdjustaDrive Kits to move eight grow lamps which is complete for the grow equipment space, plus that gives plenty of room for pathways. Or, we can think in terms of moving three grow lamps per Motor in a slightly larger indoor growing system. 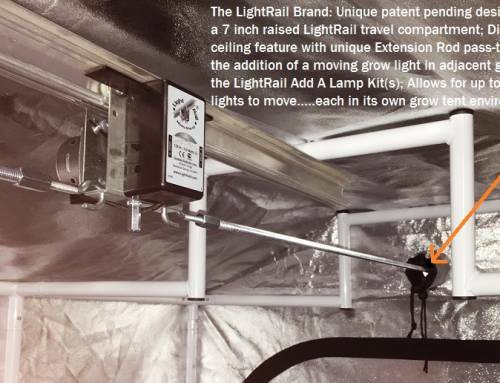 For a section of indoor growing system space that is 38’ long by 12’ wide, as another example, we can move three grow lamps in line as in a LightRail 4.20 AdjustaDrive Kit moving two grow light systems and then an extra Add A Lamp Kit to move the third indoor grow light in that same line. Then we can move over one row to repeat and then move over one more row to repeat again.A shopping list for a 38’ by 12’ section of grow light system space would be three LightRail 4.20 AdjustaDrive Kits, three Add A Lamp Kits to move the third indoor grow light in each of the three rows and three sets of Extreme Duty Trolley Wheels to go with those extra Add A Lamp Kits. For more grow light system space planning examples, here are Sample Grow Room Setups. 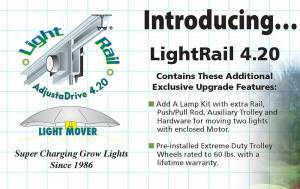 LightRail 4.20 AdjustaDrive is a commercial grade light mover made to handle load including multiple grow light systems per Motor. Any indoor growing system space can easily work with this very adaptable, scalable and easy to plan out light mover system. 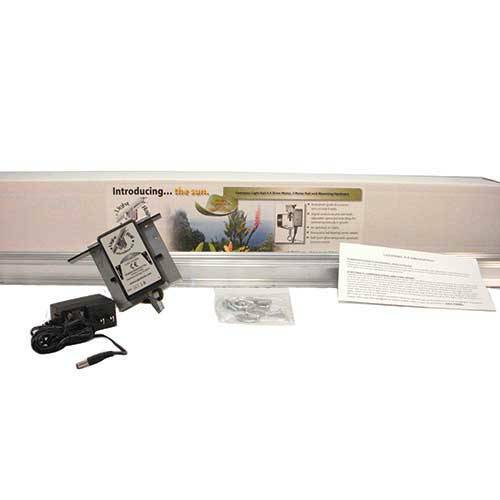 LightRail 4.20 AdjustaDrive is a workhorse of a light mover designed to get any job done and that’s for any grow light setup or for any of the grow light systems.